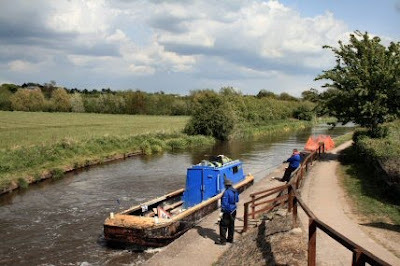 Shortly after I had left Willington I came across the Oxford Branch who were re-enacting the 1939/40 "Cressy" cruise. Tom Rolt for those that don't know was one of the first campaigners to keep the canals open while the BW of the time was busy trying to close it down. Wiki - Tom Rolt - Born in Chester, Rolt studied at Cheltenham College and then trained as a mechanical engineer, before taking up an engineering post at the Kerr Stuart locomotive works in Stoke-on-Trent. He was Vice-President of the Newcomen Society, a member of the Science Museum Advisory Council and of the York Railway Museum Committee; an honorary MA of Newcastle, an honorary MSc of Bath and a Fellow of the Royal Society of Literature. Rolt produced many works about subjects that had not previously been considered the stuff of literature: civil engineering, canals, railways, etc. 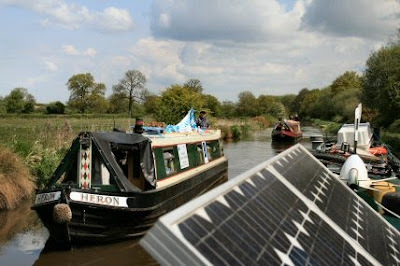 His first book, Narrow Boat, was an account of his and his first wife Angela's honeymoon journey around the canal system of the English Midlands aboard a 70-foot-long (21 m) wooden narrowboat named Cressy. 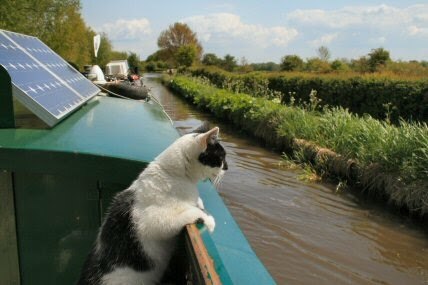 He spent 12 years living afloat. 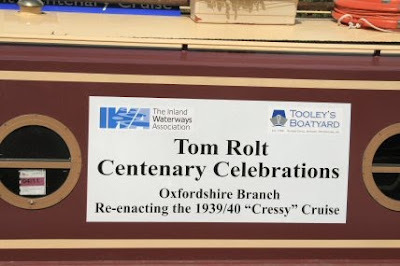 In 1945, he was a co-founder and the first honorary secretary of the Inland Waterways Association. A bridge (no. 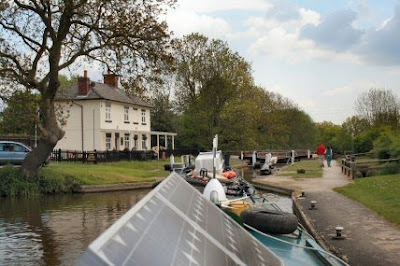 164) on the Oxford Canal in Banburybears his name (in commemoration of his book Narrow Boat), as does a centre at the boat museum at Ellesmere Port in Cheshire. From the 1950s to his death in 1974, Rolt lived in the Gloucestershire hamlet of Stanley Pontlarge. The two boats, nb Heron and nb Jupiter were dressed overall but as I had met them at a bridge they had dropped the lines to get under it in one piece. 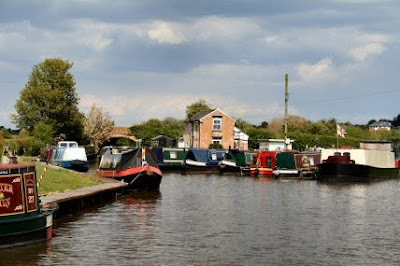 Heading up to Stenson lock and into view comes the moorings at Stenson Marina. 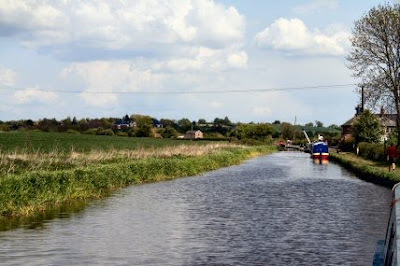 The first of the broad locks. It looks rather large after all the narrow locks of recent times. I hung about a bit to see if anyone else was coming but in the end I had to brave the rubberneckers who were enjoying the sunshine and watching the lock from the pub. The canal is still enclosed by all the trees with the occasional glimpses across the Trent valley which is quite wide at this point. I passed another couple of boats the nb Silver and nb Shalom. This time from Chesterfield. I wished them well from Chris Turner who had warned me that they were on the way. It gave them bit of a surprise. Dash came up and kept me company. I should have had more sense than to let him stay. Normally I keep him below and he took advantage of my good humour by making a leap for freedom minutes after the pic was taken. He only just made it with his back legs getting wet. 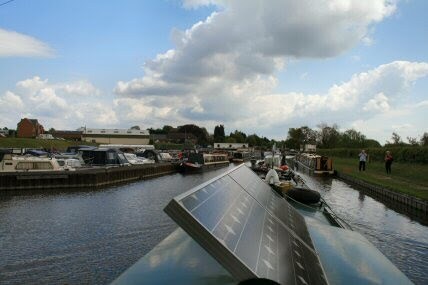 The arrival at the second lock of today. I am mooring here for the night. 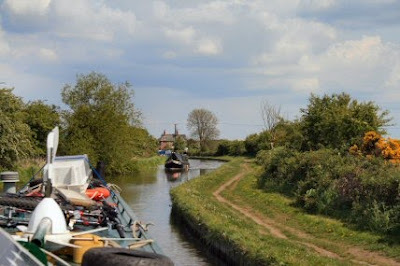 I moored around this corner and waited for Dash to catch up. Waiting for that damn cat. 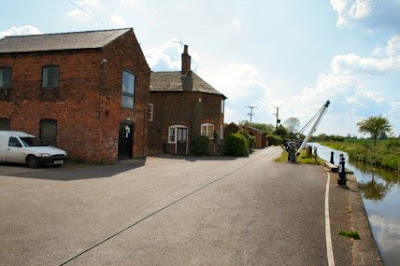 I took a walk to look at the entrance and maybe walk up the Derby Canal. This is the old Toll House and there is a stop lock in front of the crane. It is also the local BW office. 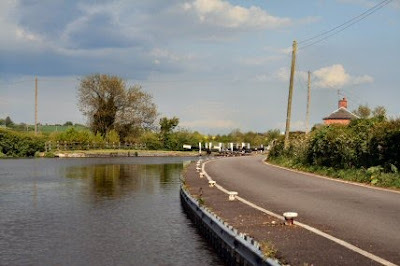 The entrance to the Derby Canal is now a long term mooring and although there are moves afoot to reopen the canal the entrance to the new canal will be from below the lock as the canal can then take the tunnel under the A50 that is already there. BW workboat Mr Polly was coming up to the office to moor up. 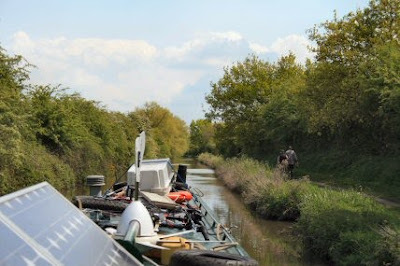 After Dash had returned I moved on to be nearer the lock and I hoped would get more water depth as it was a bit shallow previously.